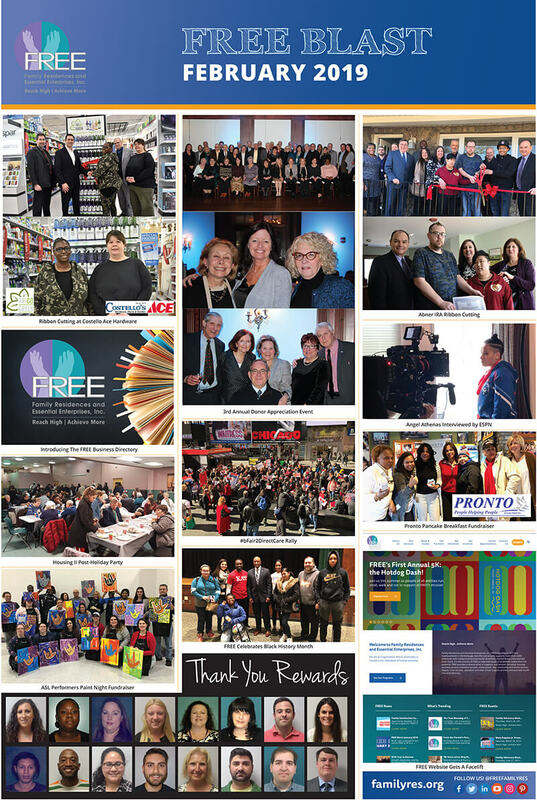 February may be the shortest month of the year, yet we were quite busy with events! Thank you to our Valued Team Members, Partners, as well as the Individuals we support for sharing their unique gifts each and every day! This event might have marked the first time a ribbon cutting was held for a store endcap and was a proud moment as it kicked off a great relationship with Costello Ace Hardware. The Long Island hardware chain is the first to carry our TRI GO GREEN products in three of their locations – Belmore, Melville, and Nesconset. We also welcomed them to our employee directory as their generosity will extend a 5% discount plus 3x extra points to all FREE employees at any of their locations when you join their rewards program. Their friendly and knowledgeable staff will help you with any of your home improvement needs. To strengthen our partnerships, we launched our brand-new Business Directory through the employee resource portal. 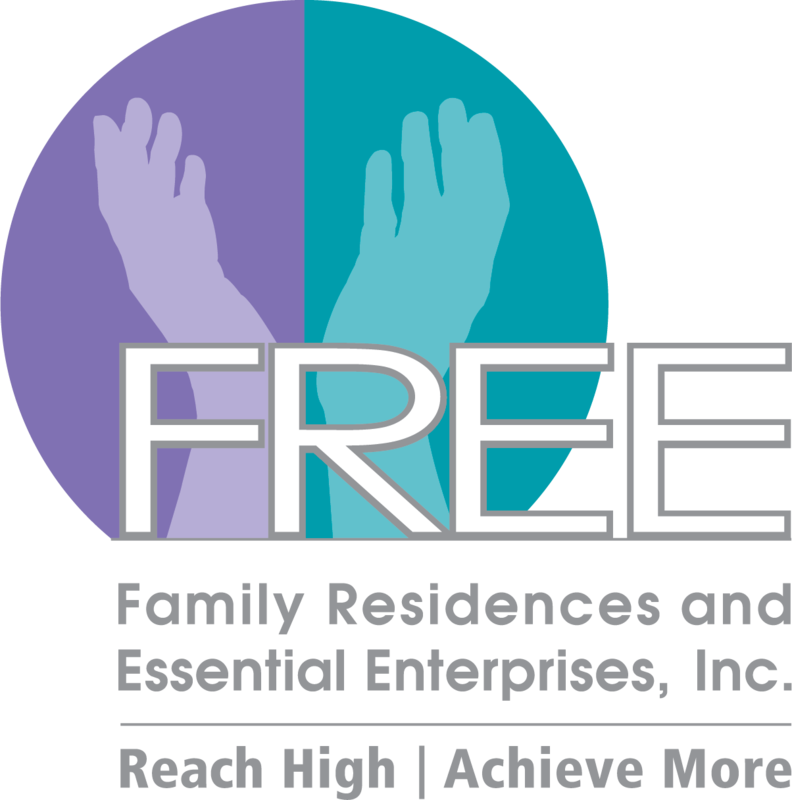 This exclusive program helps FREE’s valued team members, families, and stakeholders find businesses that support FREE’s mission. It features a vast listing of companies who support us, and some offer discounts on goods and services such as hardware, furniture, and salon services. Housing II held a Post-Holiday Party at Day Services West that incorporated all of their teams. Everyone had a great time with the abundance of fabulous music, food, cotton candy, and giveaways! Creating art is great for relaxation and for the eyes, but it is even better when used as a fundraiser. A paint night was held by our ASL Performers – a group of participants that learn American Sign Language and perform in the community. The pieces of artwork they created were amazing. Thanks to everyone who came out! We always look forward to our Donor Appreciation Event to show our gratitude to all the amazing people who consistently provide resources to FREE. As with last year, it was held at The Mansion at Oyster Bay and everyone had a wonderful time. This year we gave everyone a packet of black and white notec­­ards featuring artwork created by members of FREE’s art program as a thank you gift. Thank you to everyone who helped make this event so special! FREE staff members braved the cold to support self-advocates, family members, DSPs and state legislators for their demonstration in front of the #bFair2DirectCare billboard in New York City. The mission of this rally is to remind state leaders that the nearly 100,000 direct support professionals (DSPs) who work for not-for-profit agencies do this work on behalf of the state and deserve a living wage for their dedication. The Advantage After School Program facilitated a visit from Sheriff Toulon to speak to all the Juniors and Seniors of Wyandanch Memorial High School for Black History Month. Sheriff Toulon is the first African-American Sheriff in Suffolk County and spoke about his personal struggles, career path and the importance of making good choices. The students were super engaged, and it was a great way to foster a positive relationship for students who may have had negative experiences with law enforcement. FREE has been sharing with everyone the Thank You Rewards, showcasing the Valued Team Members who go above and beyond what is required of them. It is our honor to announce February’s nominees: Amanda Savage, Andrea Vance, Christine Church, Danielle Busch, Jennifer Marzigliano, Karen Longspaugh, Kevin Morahan, Kimberly Valdner, Lisa Vega, Leandre Turner, Loren Schinina, Michael Minasi, Monica Glamore, Nico Merone, Ryan Tessier and Thomas Koppinger. These Valued Team Members have exhibited behavior that inspires all of us to go the extra mile. If you would like to nominate someone for a Thank You Reward, please contact Pat Hogan atPHogan@FamilyRes.org. Winners of a Thank You Reward receive a gift card and thank you card to show our appreciation. FREE hosted a ribbon cutting and open house at their new residential home in Farmingville on Abner Road. The team and people we support connected with Town of Brookhaven Supervisor Edward Romaine and Robert Martinez, representing Legislator Tom Muratore, over lunch and cookies. Some of the construction team who built the home attended as well, and we all thanked them for a job which went beyond our expectations. Angel Athenas, an individual who lives at our Penelope IRA, took a break from training to conduct an interview with the cable sports network, ESPN, to speak about her upcoming trip to the 2019 Special Olympics World Games to be held in Abu Dhabi. She will be joined by more than 7,000 athletes from 170 countries who will compete in 24 summer sports, March 14-21. Angel won 4 gold medals in powerlifting at the 2018 Special Olympics in Seattle and broke the women’s deadlifting record at the 2018 New York Special Olympics in Albany. We all wish Angel a safe journey and best of luck in the competition! Pronto held a very successful pancake breakfast Applebees in Brentwood on February 23rd. Attendees enjoyed a delicious pancake breakfast and had the chance to win great prizes including gift baskets and concert tickets. Food and fundraising on a Saturday morning…what could be nicer! We are getting quite a few compliments about the new look of our website. Along with a more streamlined appearance, we put a lot of effort to make it easier to navigate for our employees as well as the general public. This will make it easier for everyone to learn about our services, our mission, and our programs, along with keeping current on our events. The employee portal will allow instant access to valuable information about benefits, employment opportunities, education, forms and more! Scrawl down to find the big blue Employee Resources button on the bottom right.